Nearly one-third of the employees who retired from the MBTA last year were under the age of 55, and dozens were still in their 40s, adding to the flow of younger retirees state lawmakers had hoped to stem years ago. The Legislature passed a law in 2009 intended to dial back a lavish public sector perk at the Massachusetts Bay Transportation Authority, but because it only applied to new hires, many employees retiring now still fall under the old rules — and potentially collect pensions for longer than they actually worked at the T.
In all, nearly 200 employees retired from the transit agency in 2018, according to a list released by the MBTA Retirement Fund in response to a Globe request. 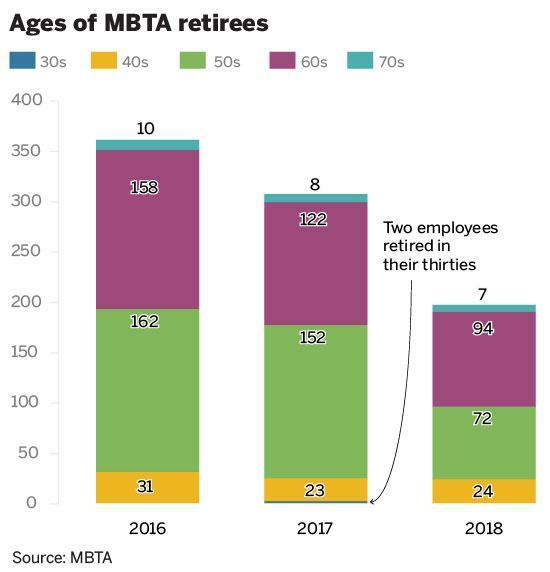 The average age of a new MBTA retiree in 2018 was 59 years old, and roughly 60 of these now-former employees were 54 years old or younger when they began collecting a pension. Two dozen were in their 40s, including Kendra J. Thomas, who retired at 47 from the T’s Wellington garage with a $63,406 pension, and Jean MacEachern, a former contract services manager in the T’s Signal & Communications Maintenance office, who is receiving a $60,353 pension after retiring at 48. Continuing waves of younger retirees could further strain a $1.5 billion pension system already beset by other concerns. More pensioners — 5,600 in total — are collecting benefits than there are workers paying in, and T officials have raised alarms over the growing payments the agency is funneling into the separately run pension fund. Steve Crawford, a spokesman for the MBTA Retirement Fund, said that eight of the 24 who retired in their 40s were getting reduced benefits because of a documented disability. Thomas and MacEachern are not among them, he said. The Legislature moved to stop T employees from cashing out an early pension a decade ago, when it ended the agency’s famous “23 and out” retirement provision that allowed workers to collect substantial pensions and free health care after 23 years on the job, regardless of age. New hires are now required to work 25 years and reach age 55 before qualifying. But a pension agreement at the time delayed by more than three years when it took effect, ensuring that only those hired on Dec. 6, 2012, or after were bound to the new requirements, according to officials. The dynamics of those retiring has shifted only slightly. In the 10 years before the law passed, 396 people in their 40s retired. In the decade since, there have been 336 — a span that also includes the T making a round of early retirement offers. 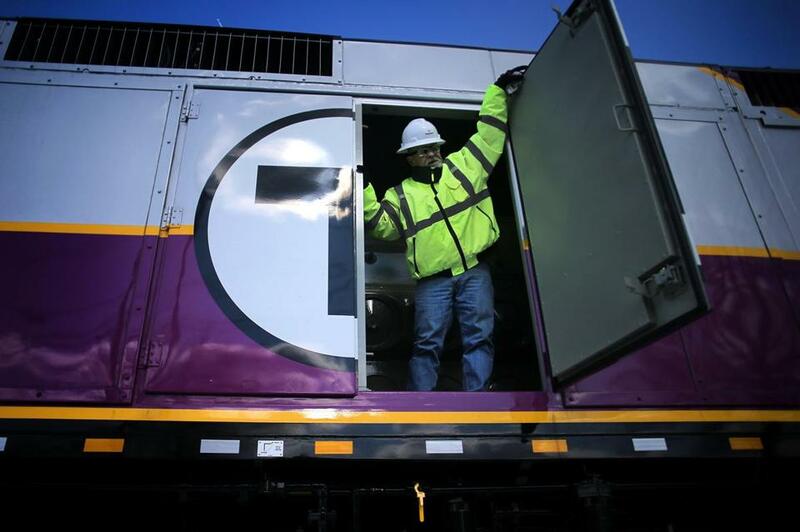 Now, more than 1,200 of those receiving a T pension — or about 22 percent — began collecting before they turned 50, and Joe Pesaturo, a MBTA spokesman, said there are 500 current employees who are eligible to retire because they’ve worked for more than 23 years. “I can’t speculate on generalities,” Crawford said. Currently, the largest pension belongs to Sean McCarthy, a former chief operating officer who retired at age 50 and has been collecting $97,617 a year since 2015. He’s followed by James M. O’Brien, the current president of the Carmen’s Union, who retired two years ago at age 57 and is collecting $91,015 annually. Lori A. Barrett, who left the T’s Power Systems Maintenance Department at age 56, is earning the highest pension among 2018 retirees, at $83,235 a year. But that information — and its possible ramifications on the taxpayer- and rider-funded T — hasn’t always been easily accessible. MBTA pension had been posted to the state’s now-defunct Open Checkbook website, but it only included information through 2015. State budget officials shuttered the site in January 2018 after the state comptroller’s office created a financial records platform called CTHRU. But while CTHRU includes information on retired state workers and teachers, it’s never included data on pensions being collected by former T employees. The release of the new data could turn a spotlight on a fight policy makers and union officials have engaged in for years over the MBTA Retirement Fund. Two years ago, the T proposed drastically changing its pensions rules, including creating a new sliding scale to determine the pension rate. For example, payouts to teachers and most state workers are determined by multiplying their years of service by an “age factor” — a number that increases from 1.45 percent for 60-year-old retirees to 2.5 percent for those over 67. In contrast, at the T, the age factor is 2.46 percent for all eligible retirees, giving less incentive to keep working. Officials said at the time that any changes would likely have to be negotiated. The pension agreement between MBTA and its largest union, the Boston Carmen’s Union Local 589, expired last year, but talks have been ongoing for months. Amid the discussions, T and state officials have focused on the agency’s contributions to the pension system, which have ballooned from $30 million in fiscal year 2007 to $103 million this year. In 2017, the Legislature passed a measure pushed by Governor Charlie Baker that allows — but does not mandate — the state’s Pension Reserves Investment Management Board and the state’s $70 billion pension fund to manage investments of the MBTA Retirement Fund. But in the two years since, there’s been little movement. Now, some state lawmakers also want to reexamine who’s a part of the fund. Representative William M. Straus, the House chair of the Committee on Transportation, is proposing the Legislature create a commission to study the impact of moving future T retirees directly into the state pension system, a move the Carmen’s Union opposes.